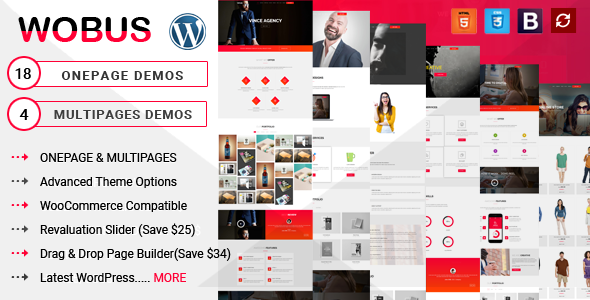 Wobus is fully responsive, creative, clean, superb and multipurpose one page and multipage WordPress theme with latest web design styles. It has perfect ready to use demos for any type of business like design corporate, agency, modern agency, startup, freelancer, mobile app, landing page, business, coming soon, blog, portfolio, login, etc.It is friendly for designer and developer customization, Speed optimized, well documented, commented, structured, well tested in all browsers & devices and contain easy to understand code. Vince is Onepage & Multi Pages Business WordPress theme. Vince comes with 18 high quality demos homes and many built-in inner pages such as service pages, case study pages, about page, contact us page and many more. Vince comes with advanced theme options and Visual Composer page builder where you can manage almost everything from admin panel, no need to have code knowledge. Vince Business WordPress Theme comes with unique style and clean code, hope you will be happy for the technical aspect of our awesome theme. The theme files are built with the Worlds most popular responsive CSS framework Bootstrap 3.x, HTML5, CSS3, jQuery and so many modern technology. Vince Business WordPress Theme has tested on all devices and browsers like Firefox, Chrome, Opera, Safari, Edge, Internet Explorer and it works perfectly without any issues. The theme features and its various options give you an amazing opportunity to interact with your clients and customers. IF YOU LIKE MY WORK, DONâ€™T FORGET TO RATE US 5 STAR AND GIVE YOUR FEEDBACK FOR BETTER UPDATE.